One of the ways the program accomplishes its goals is via the Skills Surveys that determine the appropriate level at which a child should begin the program. This way, children do not get bored with material they already know, or frustrated by material that is too advanced for them. The Skills Survey Part 1 determines a child's sequencing and keyboard skills. Sequencing is a term that refers to the visual scanning and memory skills required for reading words and sentences. While typically neglected by most reading programs, smooth sequencing skills prevent numerous reading problems later. 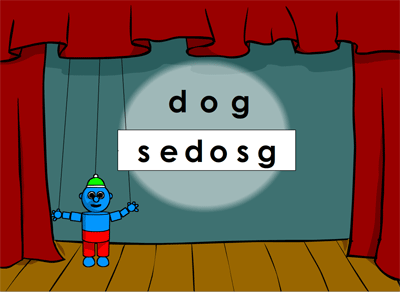 In the assessment, first a child is shown a sequence which he or she must replicate by clicking on the same letters in the row underneath in correct left to right order. The next step has the child retain the sequence in mind, so the top row disappears before the child must again select the correct letters in left to right order. The Sequencing Assessment determines whether a child needs to do the Seeing Sequences format. Depending on the results children may be given 2 of 4 levels, 4 of 4 levels or if they already have the skills, they skip the format entirely. The ability to type the letters and punctuation keys on the keyboard in a smooth, efficient manner is a skill that is essential for using the Reading Kingdom and, given the prevalence of computers in today's world, it is also an excellent skill for children to attain early. This does not require 10 finger touch typing, but rather having a clear mental map of where all the keys are so that the keyboard can be used effectively. 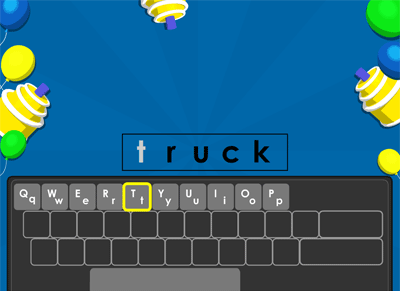 In the assessment, a child is asked to type a variety of letters on the keyboard. The Keyboard Assessment determines whether a child needs to do the Letter Land format. Depending on the results children may be given 2 of 4 levels, 4 of 4 levels or they may skip the format entirely.